Experience the exfoliating power of poppy seeds! 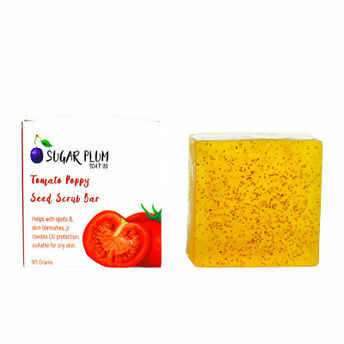 Sugar Plum Soap Co. Tomato Poppy Seed Scrub Bar brings together a host of natural ingredients to make your skin look beautiful and supple for a very long time. Teeming with the multifarious skin benefits of tomatoes, rosemary essential oil, poppy seeds, aloe vera and vitamin E, this soap is a superfood for your skin. This soap does the job of a good sunscreen and keeps your skin protected from sun's harmful UV rays. It clears skin blemishes and dark spots and will leave your skin looking flawless. This soap controls the oil content in your skin and keeps it free of acne and pimples. It has a gentle spicy aroma which will last for a long time.